His movement is excellent. His finishing will improve if he keeps playing the no.9 role and regularly puts himself in goal scoring positions. be switched ON for 90 mins and not just for short stretches in the game. The game against PSG will be a huge test against the likes of Silva, Kimpembe and Marquinhos. They struggled against Lyons pace in wide areas last night and with low crosses from the sides. If Martial and Lingard and our full backs are on their game, Rashford will have plenty of opportunities to show that hes not far behind Mbappe. Disappointed he missed the header. These chances will turn him into a 2/3 goal a game player as opposed to the one on counters. Why? Henry wasn't any more muscular than him. It'll come naturally as he gets older. He's just so naturally skinny that he must have to work twice as hard to gain any muscle. He seems to also dedicate a lot of time and effort on his fitness during the summer break. I think saying "needs to get thicker" was wrong but I would like to see him get a little bit of that Pogba/Zlatan type of muscle on him. If he becomes just a tad stronger on the ball he can be a scary, scary player especially on top of his incredible ability right now. Yeah, I agree with this. We’re not talking about Lukaku bulk, but more of the lean strength of, say, Pogba. I have to disagree. I think he'll be a far more dangerous prospect if he maximises his turn of pace and stamina rather than by gaining some extra strength. Seems to be progressing his goal scoring rate fairly naturally. In 2016/16 he had 11 in all comps. In 2017/18 he had 13 in all comps. In 2018/19 he already has 10 with plenty of football still to be played, I reckon he'll end up anywhere between 17-20. I think what he means is more just the natural development of a human body. Rashford still has a bit of a teeny bopper body and will probably naturally become a little “thicker” over the coming years. Increased strength, power and explosition which will lead to better balance and speed. Don’t think he means hit the gym and just pack on muscle for the sake of it. I don't think he needs to change anything in terms of his physicality, they're probably his best attributes. He needs to improve his composure more than any other skill and he's working under the perfect coach at the moment to improve that, which is very evident considering this streak of form. I have been watching videos of his goals since his emergence on the scene and you can see he has already improved physically a lot and to the perfect degree imo. He wasn't very muscular or looked strong under LVG. Now he has a pretty strong body and his muscles are more obvious. I think it was the 2017 summer he spent a lot of time in the gym working on his strength and physique. He was going nowhere under Mourinho at United - to have seen this guy, and Martial potentially, scoring goals and tearing it up with other clubs would have been hard to stomach. His confidence is sky high and the best thing about him is there so much more to come from him. Martial is in the same boat. It was so incredibly frustrating to watch him under Mourinho at times but in the last 9 games he just looks to be the player he can be. An absolute diamond. Apparently, Barca is sniffing towards Rashford and see him as the future striker to succeed Suarez, ex-Barca player is taping him up. I'd be worried if he was Brazilian Rashford. Doubt there's any veracity to this. Yeah, we have absolutely no worries with homegrown talents at this club do we. I'm very happy we are strong in this area still, not every club has that. You always see people being negative about our chances of buying certain players, like we are doomed for mediocracy, but at least nobody is taking our best players from us either, and especially not if they are homegrown young and talented. You're right. He needs to be more of an arrogant cheating b*stard. In all seriousness, his hold up play has improved significantly this season even without bulking up. He's really developing his all round game as a number 9 very well. And as we’ve all seen from Lukaku, being bulky doesn’t necessacarily mean being good at holding up play. He's growing in confidence under Ole, for sure. He has a variety of finishes to execute from, and he's never afraid of taking on a shot. We should keep encouraging him to take as many shots as possible and be selfish when in front of goal unless there's a clear cut opening for someone else. He has the potential to be a great player. Definitely our most potent goal threat right now. Marcus's change has been quite curious. When he first broke into the scene, his finishing and positioning to score a goal seemed natural and on a higher level than his other attributes which was strange since he didn't play that many game as the CF for the academy. Now it seems his pace, dribbling, work rate is more apparent than his ability to finish, not that his finishing is bad or anything. That's where the 'to and extant' phrase comes from. If you look at Pogba when he take this top off, he isn't bulky by any means, he's still fairly skinny but is shredded so that makes his muscles look bigger. You have to train for a purpose and that's how your muscle adapts. There's training for size (bodybuilding) and there's training for power. Football players should never train for size imo (I'm not a sport scientist but I'll explain my reasoning). In football its more important to be strong as that is a rate (amount of force produced/time). This means you can be more explosive which will be used in sprints, agility, acceleration and that sort of stuff. To train for this you need to do explosive training such as plyometrics. These are like weighted jump squats, box squats etc and the idea is to jump the highest possible in order to train the Central Nervous System to maximise as many muscle fibre contractions as possible in the shortest amount of time (ie. Giving you the biggest jump or fastest acceleration, sprint). This type of training while it WILL cause your muscle mass to grow, it won't grow substantially when compared to bodybuilding type training. This explosive movement is mainly targetted to improve efficiency of your CNS activating as many muscle fibres as possible. Now back relating to Rashford, he should most definitely do this type of training to gain strength with minimal muscle, but not bodybuilding style training as that will gain more muscle whilst also adding strength but due to the extra weight of muscle he'll lose functionality. Why would you want more muscles? I think he developed enough. The body any perfect attacker should strive to be is CR7. Fit as feck. So you don't think Cristiano is more muscular than Rashford? Otherwise, your two points are contradicting. Yeah. He is more muscular, not bigger. Right now Rashford is looking fit with his lean muscles. I don't think he needs to add more, just maintain it to perfection like Ronaldo. Sorry but that just made me laugh. I assume you mean 'to an extent'? CR7 is considerably bigger than how he was as a youngster. So is zlatan. So is Pogba. Theres this weird fear of gaining muscle because players who were pretty crap anyway (lukaku/depay) got big and played crap but guess what they always were like that! Well I never said he should get on a cycle and start doing stiffed legged dead lifts all day but "adding muscle" was a short way of saying that obviously train like an athlete would. Like you said yourself, that sort of training does add muscle. Pogba is not skinny at all imo. He may look like that on TV but he's a force. He used to be skinny when younger but over the years at Juve gained some good muscle. Look at Aguero for instance. Hes short and some would say small but the guy is built. Similarly look at Shaqiri, power packed and doesnt affect his pace at all. Rashford is still a kid growing up. Many of you are really impatient with his development fitness wise whereas for his age group, he's already among the fittest. I think we are on the same page tbh. Plyometrics will cause Marcus to gain muscle but just super functional muscle so i guess he will technically be bulkier haha. Regarding pogba we'll have to agree to disagree. On the whole i think most footballers are skinny as hell but thats due to my bodybuilding bias' and seeing people at the gym that are massive haha. If you compare them to bodybuilders then yeah most are quite skinny. I think Pogba's "skinny" is different than a Di Maria skinny though. I'm not impatient about it. He's like you mention extremely fit and there can be no complaints whatsoever. I'm just talking about what he should target for his mid 20's and later years. BTW, I've been so wrong about Rashford so I might be wrong about this. Really didn't think he would make the cut at United and end up as a bench option but this kid is incredible. I should have listened to some of the pundits who said how he's making runs under Mourinho but no one is spotting them. He is such an efficient goal scorer and reads the game so well. I think he'd need to add one more weapon like mastering long shots or heading to really be at that Aguero level of a striker. He's young and I believe he can do it. I always chuckle at soccer fans thinking that "bulking" up makes people slow and ungainly. The most explosive athletes in the world, do power lifts, to gain mass, to increase how explosive they are. Look at male gymnasts. The most agile people alive, and they are JACKED. They are tiny dudes, but they are so yolked out of their minds that if you made those dudes 6'4 and not 5', they'd be 240 pounds +. 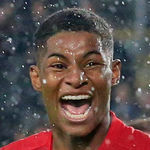 Rashford could easily put on 20 pounds of lean muscle mass, and so long as he didn't tire through a match because of it, he'd be faster, stronger, quicker and more agile. The only point of diminishing returns on mass on football, is the cardio aspect. He's also a striker, so it's not like he needs to put in the high intensity distance like a midfielder does. Strikers need conditioning, but they express that conditioning typically for short explosions of energy. His long shooting is fine, he could definitely be better in the air though. You're not wrong but none of the sports you talk is close to football in terms of running/stopping/turning. With more muscle mass, Rashford would be faster and stronger but in no way more agile. That I don't believe is possible, at least not the type of agility needed in football. There was a great documentary comparing Ronaldo to a pro sprinter, obviously in a straight line the sprinter was faster but when cones and flags were introduced, Ronaldo was faster because of his agility.